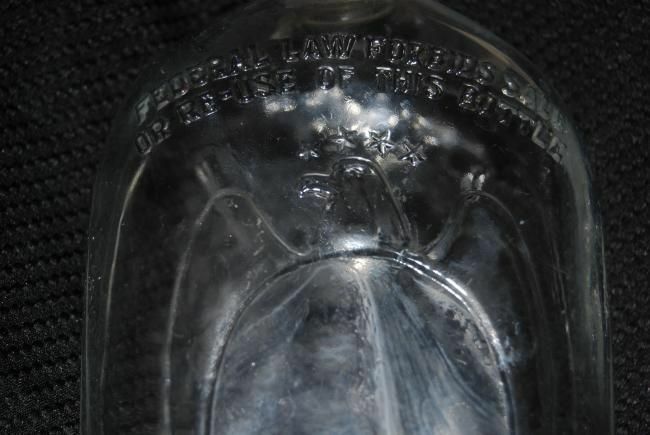 The bottle i have is embossed with Federal Law Forbids Sale or Re-Use of this Bottle. I have not found one that looks like this one. 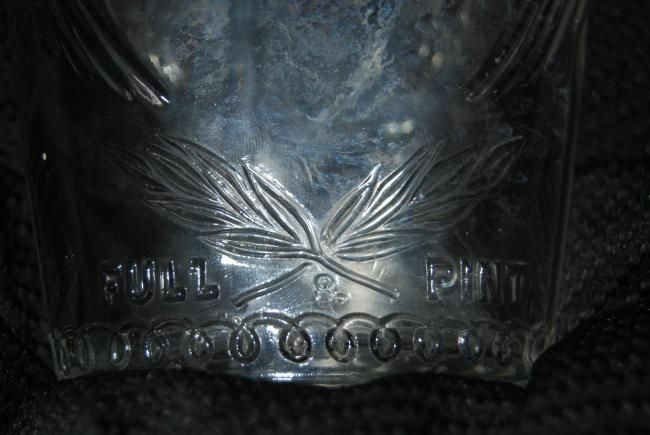 It is clear with those words on the top front and an eagle with four stars on top of the eagle's head. And on the bottom of the eagle are two wheat stick that cross each other. At end of the bottle it has swirls all around the bottle. The bottom has numbers D 460 5 2-7 on it. There is a cap but half of what was on the cap is gone. What i can see is a bearded mans bust on top and two words underneath. The first work ending in "vert". The second words ending in "ing". I would like to know what the eagle is about. It also is a Full Pint. I would appreciate any information. 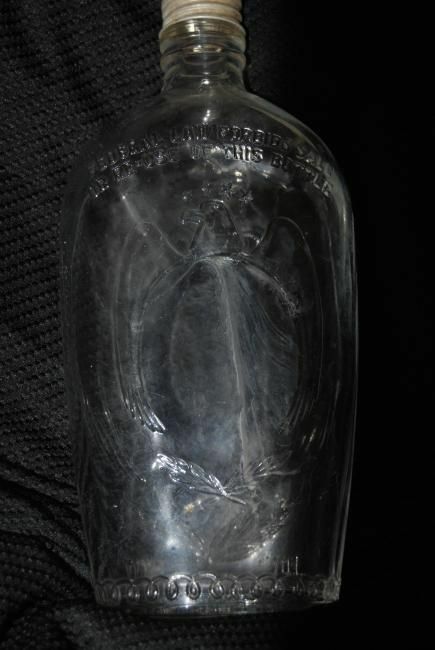 Here are a couple pictures of the bottle. This is the best pictures I could take. Please let me know what you think. Thank you. what kind of alcoholic beverage would be named Calvert? Neat looking bottle even if it is pretty modern. Could the plant be barley or rye instead of wheat? I Don't know if the cap is the right one it was on it. I still have not found anything out about this bottle. 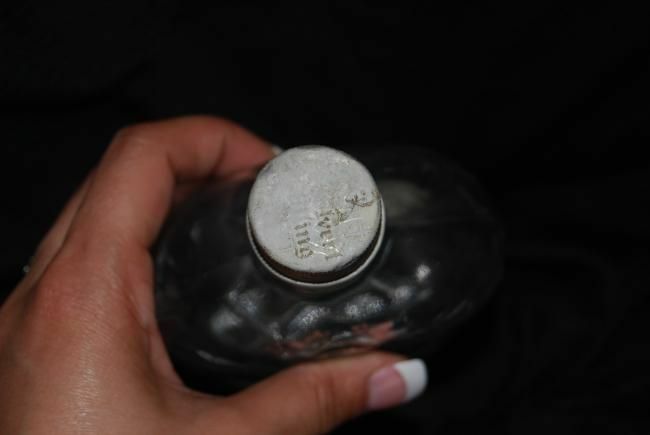 Can you please give me information on this bottle. Thank you. 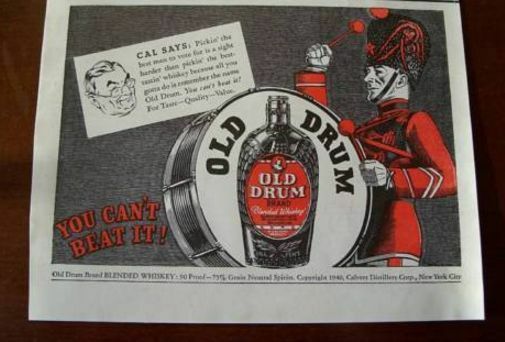 Can you confirm that the base markings include either "D-460" or D 460"
Evidently, this was the bottle for Old Drum Whiskey, a Calvert brand. The advertising I found for this product dates from the late 1930s and early 1940s. See attached graphic which I found on ebay. 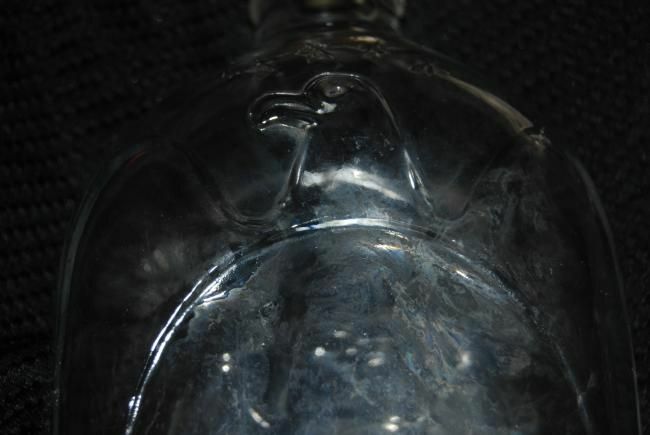 I have seen another bottle, different size and shape entirely, with the same eagle embossed, which is marked D-126. In my notes #126 is related to Calvert.